·Schedule your complimentary consultation. During the consultation, we will go through every detail of the gown with you and give you an estimate. ·Once your gown is processed, a rigorous inspection process is performed to identify any spots to be worked on or material that needs to be repaired. ·We’ll determine what method of cleaning is best for your gown. 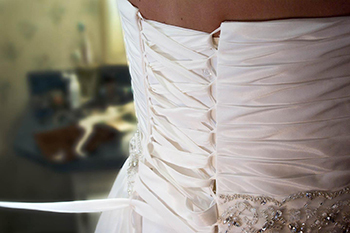 We have decades of experience in bridal gown cleaning and restoration to make this determination. ·Your gown is pressed/ steamed to its original shape. Whether you’re wearing it tomorrow, or your daughter 30 years from now— you’ll love the dress all over again. ·Preservation. This is a crucial step when storing your gown. We package your dress in an acid-free box with acid-free tissue. This prevents any yellowing or staining that would otherwise occur naturally. ·Delivery. We know your time is valuable. That’s why we’re proud to offer bridal gown delivery at no extra cost.